The blueprint for a tiny, ultra-robust mechanical computer has been outlined by US researchers. The energy-efficient nano computer is inspired by ideas about computing first put forward nearly 200 years ago. Writing in the New Journal of Physics, the scientists say the machine would be built from nanometre sized components, just billionths of a metre across. 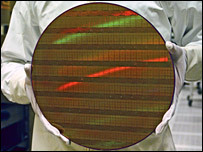 Chips based on the design could be used in places, such as car engines, where silicon can be too delicate, they said. "What we are proposing is a new type of computing architecture that is only based on nano mechanical elements," said Professor Robert Blick of the University of Wisconsin-Madison and one of the authors of the paper. "We are not going to compete with high-speed silicon, but where we are competitive is for all of those mundane applications where you need microprocessors which can be slow and cheap as well." In addition to high-temperature automotive applications, Professor Blick envisaged nano mechanical chips being used in everything from toys to domestic appliances. Mechanical computers are nothing new. The remains of a 2,000 year old analogue computer known as the Antikythera mechanism were discovered in Greece in 1902. And during the nineteenth century, English mathematician and engineer Charles Babbage designed various steam powered mechanical computers. His "difference engine", for example, consisted of more than 25,000 individual levers, ratchets and cogs and weighed more than 13 tons. Although none of his designs were ever finished, recent reconstructions by London's Science Museum show they were capable of carrying out complex calculations. The US team's proposal owes a debt to these early concepts. 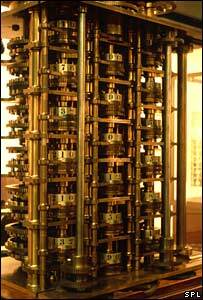 "It's inspired by Babbage's ideas but these days we can scale it down," Professor Blick told the BBC News website. "Now, we are able to process devices on the nano scale." The team's tiny, hypothetical number-cruncher could be built out of ultra-hard materials such as diamond or piezoelectric materials, which change shape when an electric current is applied. Unlike today's computers, which are based on the movement of electrons around circuits to do useful calculations, the nano mechanical computer would use the push and pull of each tiny part to carry out calculations. The researchers are currently building the first elements needed for the computer, focusing initially on transistors, the basic switches at the heart of all computers. 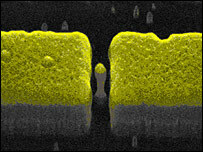 "We have demonstrated that a single element of these transistors work," said Professor Blick. Simulations also suggest that it should be possible to build working circuits, he said. "We are quite confident that in a couple of years this work will lead to commercial applications," said Professor Blick. The American military is interested in a working device because unlike traditional chips, nano mechanical devices are not susceptible to electromagnetic pulses, which could be used by an enemy to knock out computing systems. However, the team believes the chip's key advantage could be in keeping up with the chip industry's relentless pursuit of Moore's Law. The proposition, articulated by Intel co-founder Gordon Moore in 1965, states that the number of transistors on a chip could double every 24 months. "The smaller you make your devices, the more electrons rush through and the hotter your device gets," said Professor Blick. "In the not too distant future we will reach a thermal limit." At that point, the heat will interfere with the function of the circuits and offset any efficiency gained by packing more transistors on to the chip. The mechanical devices run much cooler than silicon and should therefore not suffer from the same problem. But Dr Michael Kraft of the University of Southampton believes it will take a lot to persuade the silicon industry to abandon more traditional chip designs, such as the common circuit pattern known as CMOS. "The industry has been working with CMOS for almost 40 years and there is already so much expertise and infrastructure," he told the BBC News website. "I think, commercially, industry will continue with CMOS up to the point where it is absolutely not possible to push it any further." However, he said, the nano mechanical approach did offer certain benefits that could one day lead to the development of hybrid chips. "They consume less power which is more and more important because most computers are mobile these days," he said. "The battery is the big bottleneck, so anything that reduces the power consumption is a real advantage."